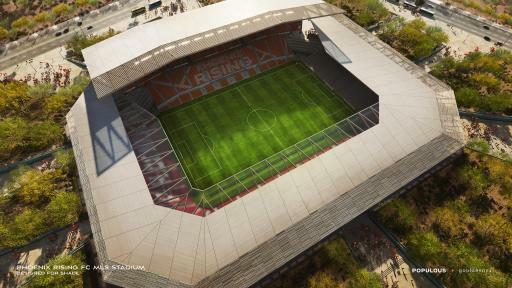 (PHOENIX) March 15, 2018 – Phoenix Rising Football Club, entering its second season in the United Soccer League (USL), released today the first glimpse of the proposed Major League Soccer (MLS) stadium designs, in anticipation of the announcement of the MLS expansion teams. 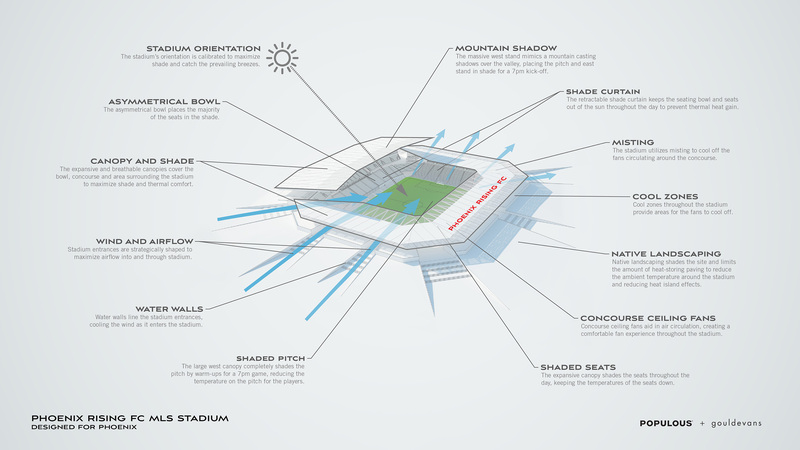 Populous, a leading sports and entertainment architecture firm that has designed seven MLS stadiums; and Gould Evans, a Phoenix-based multi-disciplinary design firm with expertise in environmentally responsive structures, collaborated to create a stadium inspired by the intimacy and energy of European soccer stadiums. 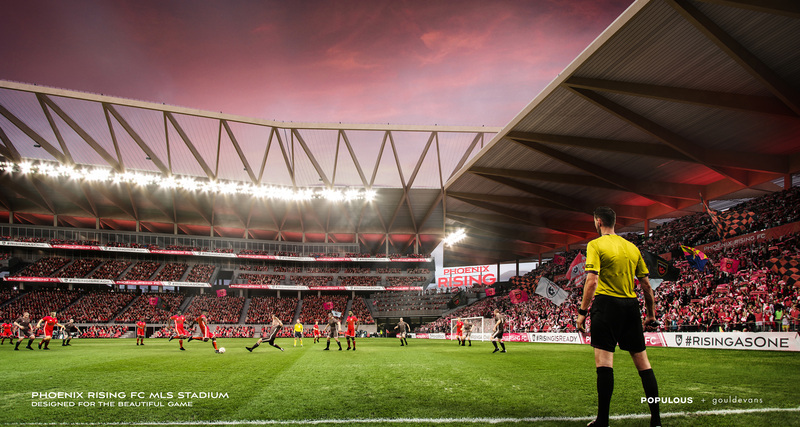 With approximately 21,000 seats, and a 360-degree concourse, fans will not miss a minute of the on-field action. The asymmetrical design places the majority of seats on the west side and provides ample shade. Stadium entrances are strategically shaped to maximize airflow, featuring water walls to cool patrons as they enter. 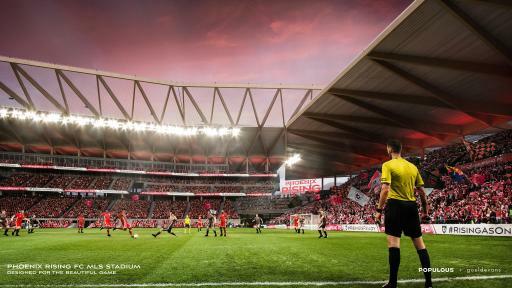 Expansive, breathable canopies will cover the bowl, concourse and area surrounding the stadium to maximize player and fan comfort while amplifying the energy and excitement within the stadium. Phoenix is one of 11 cities competing for three MLS expansion slots, which are scheduled to be announced in 2018. 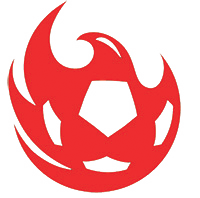 Phoenix Rising FC is the highest-level professional soccer franchise in Arizona’s history. Legendary Chelsea and Ivory Coast striker Didier Drogba, Kona Grill CEO Berke Bakay, International Entrepreneur Alex Zheng, and an impressive collection of business leaders and international celebrities own the club. 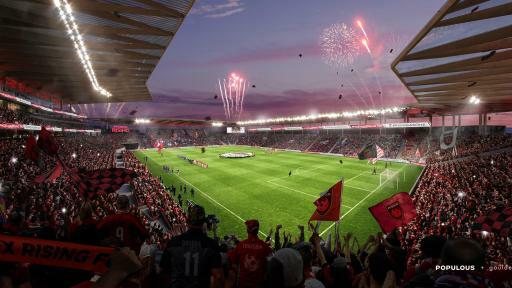 Established in 2013, Phoenix Rising FC is one of 11 cities applying for Major League Soccer expansion. The club currently plays in the United Soccer League, the largest Division 2 professional league in the world. In October 2017, Phoenix Rising FC acquired Premier Development League (PDL) side FC Tucson as part of its long-term plan to develop professional players for its franchise. The club also owns and produces the largest MLS preseason event ever, the Mobile Mini Sun Cup. During spring of 2018, 13 MLS teams joined Phoenix Rising FC for preseason training in Phoenix and Tucson, Ariz. The 2018 Season is presented by Equality Health. For more information about the club, visit the team's website at PhxRisingFC.com. You can also follow the team on Facebook (PHXRisingFC), Twitter (@PHXRisingFC), Instagram (@PHXRisingFC), Snapchat (PHXRisingFC) and YouTube (PhoenixRisingFootballClub). For season tickets call (602.900.0083) or visit PHXRisingFC.com. Populous is a global architecture and design firm that designs the places where people love to be together, like Yankee Stadium, the London Olympics, and the Super Bowl. Over the last 35 years, the firm has designed more than 2,500 projects worth $40 billion across emerging and established markets. Populous’ comprehensive services include architecture, interior design, event planning and overlay, branded environments, wayfinding and graphics, planning and urban design, landscape architecture, aviation and transport design, hotels and hospitality, and sustainable design consulting. Populous has 15 offices on four continents with regional centers in Kansas City, London and Brisbane. 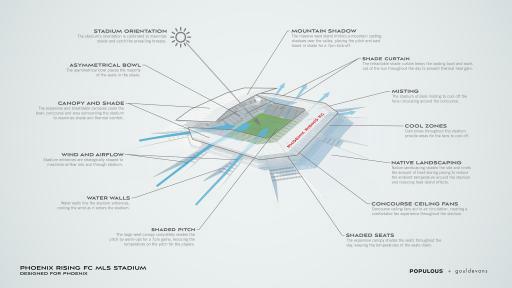 For more information visit www.populous.com or follow @Populous on Twitter. Gould Evans’ award-winning designs are recognized for their specificity to people and place. Their diverse portfolio stems from a design process that starts with the client’s goals and utilizes a multi-disciplinary design approach to craft a customized experience of space and brand. The firm’s passion for regionally responsive architecture and design aims to positively impact communities and contribute to vibrant culture. Gould Evans was chosen for their “Yes…And” approach, reaching beyond standard design practices to embrace the quality of the environment and the long-term future of the community, the building and the site. Gould Evans’ mastery of experiential design encompasses urban planning, architecture, interior design, graphics and branding at all scales. To learn more, visit www.gouldevans.com or follow @gouldevansassoc on Twitter.